I am fresh back from my paternity leave. The family is well. "Ethical" Elsa - as she is known in the office - is a happy and healthy little baby who's been getting through a good many washable bamboo nappies every day. Bee is delighted with her and Eva and Zola have been wonderful, very tender and loving. But after three weeks away from my ethical beat and I have a few things I feel I should get off my chest - ethical confessions, if you will. 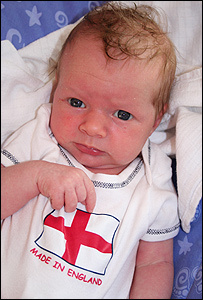 I was fortunate that my paternity leave coincided with both the start of the World Cup - Elsa is a keen England supporter - and a period of exceptionally good weather. Way back in early March we had two large water butts installed. Together they hold almost four hundred litres of London rainwater - collected direct from our roof. Since the hosepipe ban was imposed in the Thames Water area on 3 April they've been invaluable: our only source of water for the garden. But even our double-barrelled supply has proved unequal to the challenge of this hot spell and two weeks ago they ran dry. Now, Bee is a very keen gardener and was naturally upset to see the lawn and flower beds she had so careful tended begin to wilt and brown. So we resorted to extreme measures. We didn't follow the example of 10 Downing Street and get a douser with a bowser. No, we went one step further and took a hose to the garden. Before you protest, what we did is permitted under the hosepipe ban. Indeed, I got advice from Thames Water itself. Hilary in the press office told me that under the arcane hosepipe ban rules you cannot use a hose to water the garden or wash a car but you can use one to wash down the patio, clean your windows, give the dog a good soaking, have a water fight or anything else you can think of - including filling a paddling pool or for that matter, a swimming pool (if you happen to have one). The kids were filthy and needed a wash. By letting them play in the pool we saved a bath full of water. 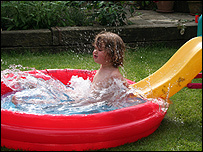 Once they'd enjoyed a cleansing frolic, we used the paddling pool water on the garden. As well as hot weather and footie my paternity leave coincided with my 40th birthday. We decided to celebrate in style with a gourmet meal in a fantastic country restaurant. The restaurant I'd chosen has an amazing reputation. Not only is the chef world renowned but his restaurant is in a beautiful Manor house nestling in the Oxfordshire countryside. It is hideously expensive but hey, I'm only going to be 40 once. However, as Newsnight's Ethical Man, I had a problem: how to reach this gastronomic amusement park now that my car has been taken away? Before I was bamboozled into becoming ethical the trip would have been simple; we would have bundled into the car - baby, pram and all - and off we'd have gone. Of course things are different now. I looked at the possibility of going by train but because Bee and Elsa were both still a bit fragile after the birth, we would have needed taxis at both ends of the journey. That would have been very expensive as well as carbon intensive... so we hired a car. Yes, less than two months after Newsnight winched away my car and Ethical Man was back at the wheel! There was no viable alternative to using a car. The car I hired was small and fuel efficient. vEmissions per passenger were low because there were three people in the car (when you include little Elsa). And finally, what else could we have done? Except, of course, giving the money we spent on the - here comes confession number 3 - confit of Landais foie gras with rhubarb compote and toasted sour dough bread or the Valrhona "Araguani 72%" chocolate mousse with lemon butterscotch sauce and almond milk crème glacée to charity and whipping something simple up at home. But I'm not sure that would have marked my passage into middle age quite as memorably. That drive to Oxfordshire got me wondering what had become of my car. Sara had been a bit coy about where she'd put it after it was towed away from our house. It didn't take long to get her to tell me where it was. It turned out it was parked right under my nose, in the BBC car park. Now it was Sara's turn to make a confession. She told me she hadn't actually got permission to leave the car in the car park. She'd had it driven in using a day pass and it had just been left there ever since (after its location had been carefully noted, of course). The car is a battered old second-hand Saab but is still worth a bob or two so naturally I was a little anxious. I mentioned to our web master, Stuart, what had happened. What he told me made me even more concerned. 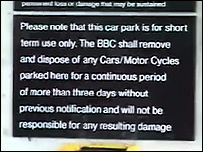 He said there is a big sign at the entrance to the car park which says that any cars parked without permission will be towed away and that the BBC will not accept responsibility for any damage done in the process. Bee felt the first big contractions at around six o'clock on Saturday afternoon. She knew this was it. This is our third baby and it was already two days overdue. Our first two children were born at home, but this time Bee had opted for a hospital birth and now we had to decide when to go in. It is a tough call. Every labour is different: sometimes it can take hours to become established, sometimes it can take minutes. But we had an additional factor to take into account because, thanks to Newsnight, we don't have a car anymore. When the car was first taken away Bee was still pretty mobile and coping without it was not too much of a problem. The children's school is nearby, we are well served by buses and the tube, and there are some good local shops. It may have been difficult to go and visit friends at short notice or to whiz off on some family activity, but given a bit of time and planning life didn't change that much. As the pregnancy progressed Bee became bigger and moving became more uncomfortable. Now not having a car really started to make a difference. She would have gone to swimming and antenatal classes at the local health club more often, and it would have been much easier to pop over to see friends. I felt guilty - we would still have a car if it wasn't for the Ethical Man project - but Bee didn't complain. In fact, even in her last month of pregnancy I think I still missed the car more than she did. It was only at a family party in early May that we realised that we hadn't yet given any thought about how we were going to make that crucial journey to hospital. As some of my relatives rather gleefully pointed out, if the labour developed quickly Bee simply wouldn't be able to walk in, even though we live quite close by. We needed to find someone who would be willing to give us a lift. The problem is it is impossible to predict with any accuracy when labour will start. You are given a due date but told that the baby could come anytime within two weeks of that day. What we would need is someone who would be willing to be on standby 24 hours a day over that period. In the event, both my cousin Alex and my parents gallantly stepped up to the mark. By nine o'clock on Saturday night, the contractions were becoming stronger and by midnight Bee was having quite strong and painful contractions every five minutes. My parents were round within 15 minutes. But - sod's law - once Bee began to walk around, things eased off a bit. We were faced with a dilemma: we'd got my parents waiting outside with the car, but were worried that labour wasn't well enough established to justify going into hospital. Bee decided to walk to hospital, hoping it might bring the labour on. She was confident she could ride out any contractions along the way. But, just in case, my mother followed in the car, hugging the kerb at walking pace. After an examination at the hospital we were politely told that we had come in too early, and sent home to wait until things livened up. Rather than call my folks out again we walked back. By two o'clock in the morning there was no question that labour was properly underway, and we quietly slipped out of the house and made the final journey to the hospital by foot. Bee had to stop every few minutes as another big contraction hit, but it was manageable. Second time around the hospital was happy to admit us. There had been some complications with the birth of our second child, Zola, who was born at home. This time Bee wanted pain relief and peace of mind, and that's what she got. 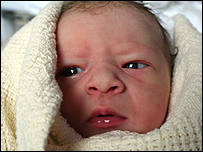 Our little girl was finally born 14 hours later at 10 past five on the afternoon of Sunday, 28 May. There were laughter and tears. Despite having doing all the hard work, Bee laughed with joy. I wept in a combination of relief and happiness.